This one is pretty straightforward. 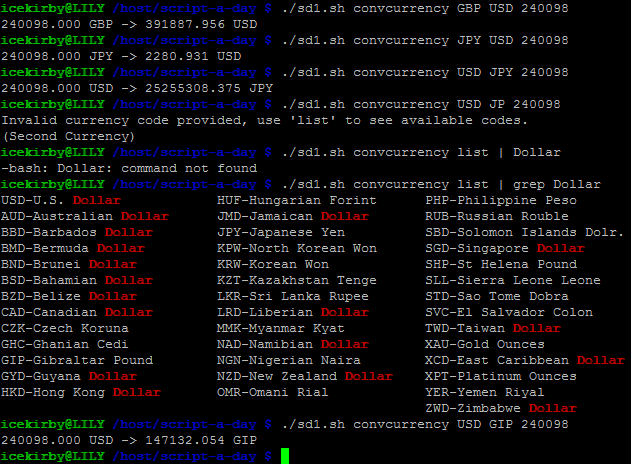 It accepts a currency pair and does the conversion you ask of it. Without an amount argument, it’ll default to 1 of the source currency. It’ll print 3 decimal places regardless of the currency, and of course the rates aren’t guaranteed to be exactly what the API returns. Especially when you start considering fees and the like which this doesn’t account for at all. It should give a pretty good ballpark number though. Link to the script-a-day repo.